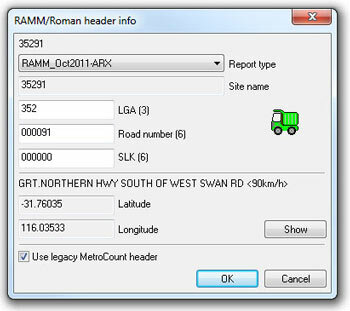 Working with ARRB, WALGA and RAMM Software Limited, MetroCount has developed a traffic data format to streamline the upload of traffic data to ROMAN II. 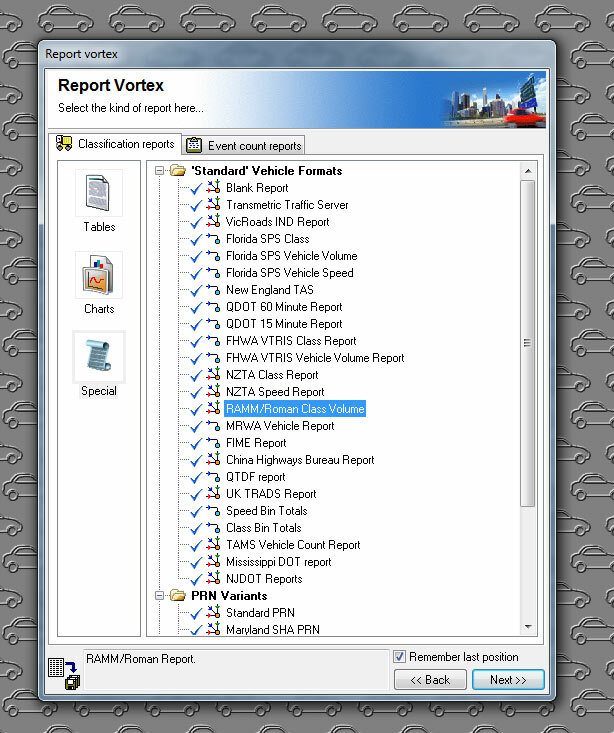 Utilising the ‘Special’ RAMM/Roman Class Volume report, you can rapidly process data gathered with your MetroCount Vehicle Classifiers to generate reports compatible with ROMAN II. To upload MetroCount traffic data into ROMAN II in MTE V4.06 follow the below steps. 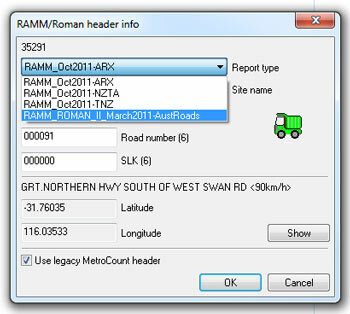 The following prompt screen requires the ROMAN II format site data to be entered and the report type selected. Once the report has been generated, select save as, ensuring that the file name is not changed. The saved file is now ready to be imported into ROMAN II. To begin processing your data, you will first need to download and extract the files in the following zip file. Data processing instructions are available in the accompanying PDF document. 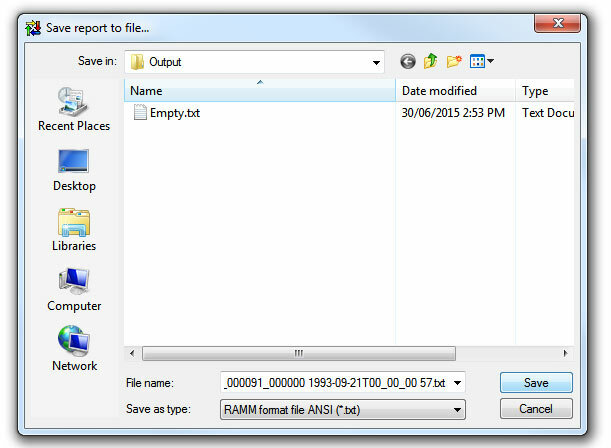 The ZIP file contains two files: ROMAN_II_March2011.xpt andROMAN_II_March2011.ini. 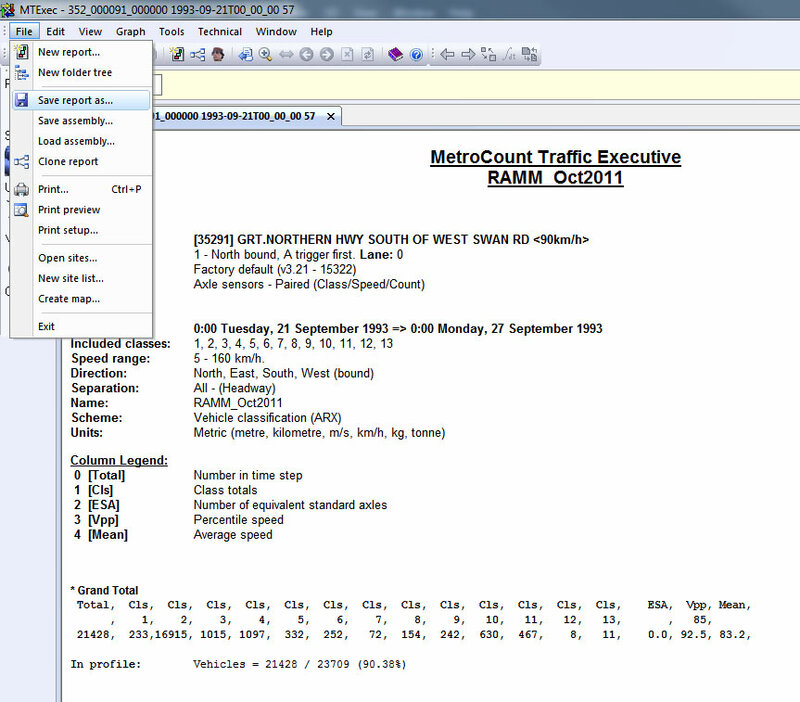 These files work with MetroCount Traffic Executive (MTE) version 3.21, but may not work correctly with earlier versions. Get in touch if you need an upgrade. You may need to speak with your system administrator for assistance or we can email the files to you directly. Call us or contact support@metrocount.com for assistance. Where nnn is your three digit LGA number, xxxxxx is the six digit road number, and yyyyyy is the six digit SLK (Straight Line Kilolmetres) reference at the survey location, separated by the underscore (“_”) character. What is the ROMAN II Custom List? The ROMAN II Custom List is a specific template developed to be compatible with ROMAN II. It works with its own “Private Profile” to ensure that MCReport uses the correct report settings. It generates a simple summary of traffic data with a grand total of traffic counts, an Austroads ’94 classification breakdown and a speed summary (NOTE: the speed summary is not used by ROMAN II). How do I generate the ROMAN II Custom List? You generate the ROMAN II Custom List just like any other MetroCount report. See MTE’s online help for further details or contact us atsupport@metrocount.com for assistance. After generating the ROMAN II Custom List, you need to save the output in Plain Text format. Where are the saved ROMAN II reports? Just like many other MetroCount reports, you can generate the ROMAN II Custom List for two or more MetroCount datasets from the same location as a group. 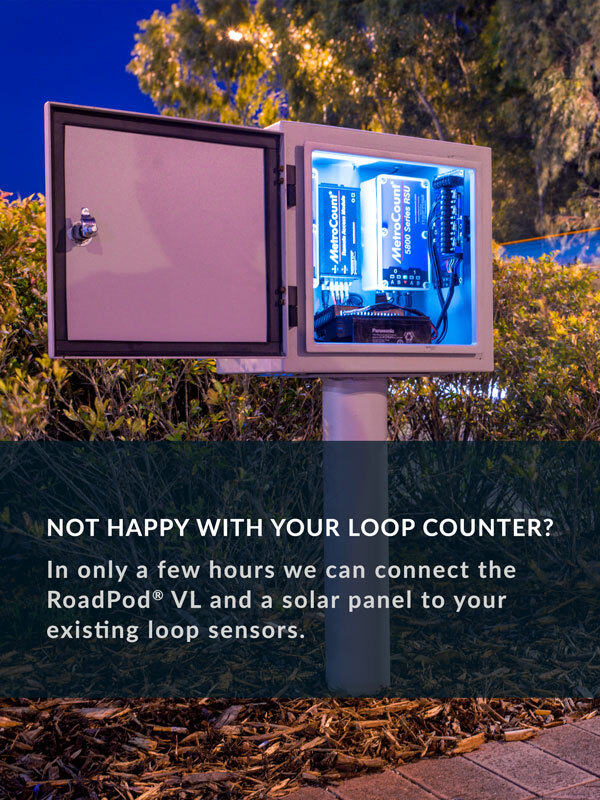 Visit the MetroCount Technical site for details. Note: ROMAN II expects a complete dataset for every road section. Therefore it is imperative that any data from two or more lanes be gathered at the same time. Any period where data does not overlap will result in reduced traffic volumes being uploaded. How do I upload the ROMAN II report to ROMAN II? You will need to contact the ROMAN II help desk for support. Old data gathered with a different Site name will need to be “transformed” usingMCReport’s File Tree. Contact us at support@metrocount.com for assistance.